The Tet New Year in Vietnam falls on 9 February 2013. Most people hope for change and improvement during the New Year. We live in taxing times. The economic turmoil in some countries showed few signs of real recovery. The wars in other countries did not seem to have any permanent cessation, only truces. Perhaps in these trying times, one could read the diaries of Dang Thuy Tram for a message of hope. When Dang Thuy Tram wrote her diaries from 1968 to 1970, it was supposed to be a private document. She probably had no inkling that her diaries would one day be published for public reading as “Last Night I Dreamed of Peace: The Diary of Dang Thuy Tram.” Her diaries showed the resilience of the human spirit despite the privations and separations caused by the war. On 30 January 1968, the North Vietnamese launched the Tet Offensive. They assaulted 36 out of 44 provincial capitals and five out of six cities. Although the offensive was a military failure, later events showed that it was a political success. During the Tet Offensive, the US marine base at Khe Sanh endured a siege which lasted 77 days. The journalists took real time footage on television of the Tet Offensive which was screened to the folks back home in the United States. This provoked a public outcry against the Johnson administration and led to anti-Vietnam war riots. In that sense, the moral turning point of the war had been reached. Dang Thuy Tram was serving as a doctor with the North Vietnamese army in the front lines. On 22 June 1970, she followed three companions along a jungle trail. They encountered an enemy patrol from D Company, 4th Battalion, 21st Infantry Regiment. The patrol opened fire, killing her and one companion, later identified as a Viet Cong soldier known as Boi. A search of the bodies revealed her diaries. The diaries and other documents were sent back to Fred Whitehurst, a military intelligence officer based at Duc Pho, some ten miles away. Back in the States, he studied for a doctorate in chemistry and became a forensic expert with the FBI. At the back of his mind, he wanted to return the diaries to those he deemed the rightful owners – the family of Dang Thuy Tram. But he had no idea how to trace the survivors of the family. As he was working for the FBI, he certainly could not approach the Vietnamese embassy. After the bombing of the World Trade Centre in February 1993, he became a whistle-blower by exposing corruption at the FBI. This resulted in some acrimony with the agency and he decided to quit. He was now a free man and could seriously think about returning the diaries. He gave them to his brother Rob who was another Vietnam War veteran. Rob had married a Vietnamese woman and knew some Vietnamese. Rob translated the diaries and became as fascinated by them as his brother Fred. In March 2005, the brothers attended a conference on the Vietnam War conducted at the Texas Tech University. There they met an USAF veteran who planned to travel to Hanoi the next month and gave him a copy of the diaries. This veteran managed to locate the family of Dang Thuy Tram. The diaries were published on 18 July 2005 in Hanoi as “Nhat Ky Dang Thuy Tram.” To the publisher’s astonishment, they sold 430,000 copies within 1 ½ years. In Vietnam, it was an achievement if a book could sell 5,000 copies a year. 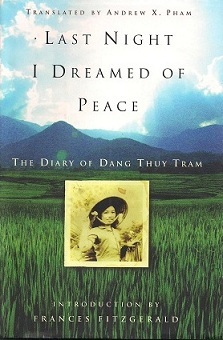 The robust sales encouraged the translation of the diaries into English by Andrew Pham and were published as “Last Night I Dreamed of Peace: The Diary of Dang Thuy Tram” (Random House, 2007). Dang Thuy Tram was born in 1943, the eldest of five children - four girls and a very much younger boy. Her paternal family were doctors for three generations. Her mother, Doan Nyoc Tram, also came from a family with a medical tradition. She herself became a pharmacologist specialising in traditional herbal medication. Dang’s parents could have chosen to live in relative comfort and luxury in French Indo-China. At that time, North and South Vietnam did not yet exist. Instead, they were known as Tonkin, Annam and Cochin-China. However, her parents decided to join the struggle for independence from the French colonial masters. Their choice meant that they now had to live in a one room house. But there was literature and music in the house. Their father, Dang Ngoc Khue, wanted each of his daughters to learn at least one musical instrument; they chose the guitar. As Dang Thuy Tram was beautiful and intelligent, many of her male class mates became infatuated with her. She studied at the prestigious Chu Van An high school. She continued her studies at the Hanoi University Medical School for training as a surgeon. She had been offered a place for advanced studies in optical surgery. But she chose not to pursue her studies. Instead, on 23 December 1966, she boarded a truck with other civilians. They were bound for Quang Binh Province, some 250 miles south. After disembarking at the staging area, she trekked through the Ho Chi Minh trail and reached Quang Ngai Province sometime in late March or early April. She wanted to use her medical skills as a doctor in the front lines of the Vietnam War. This decision would unfortunately cost her life. Dang Thuy Tram’s diary is revealing for several reasons. At the basic level, it showed a doctor who cared about her patients. But she also cared about the Party’s struggle for independence. She yearned for the day when independence and peace would come to her country. She was also homesick and yearned to see her parents and siblings again. She was a young woman very much in love with a man who did not seem to return her love. Dang Thuy Tram was born on a 癸Yin Water day in the winter month of the 亥Pig. Since her water element was born in season, her day master was considered strong. Water also represented creativity in an imaginative way so this also indicated that she was a creative person in the artistic sense. Her 未Goat day of birth had a Three Harmony relationship with her亥Pig month. This combination resulted in the wood element. As water produced wood, it meant that her productivity or output was strong. In practical terms, it hinted that she was a diligent, hard working person. As the wood element was also said to represent kindness, it could indicate that she was probably a kind person. Her mother was represented by the metal element because metal produced water. There was metal in the Heavenly Stem above her 亥Pig month. However, this metal was weak in the winter season. There was no root for the metal in her known pillars of day, month and year. But her未Goat day did not clash with her 亥Pig month which was the pillar that represented the mother. Instead, her 未Goat day had a harmonious relationship with her 亥Pig month. This meant that she had a close relationship with her mother. Her diaries revealed that she was in love with a man she identified as “M”. Her translator, Andrew X Pham informed us that M was a Viet Cong soldier who had some twenty wounds in his body. Perhaps he felt unworthy of her love; probably he did not even expect to live very long. At any rate, after the war was over, he eventually married and settled down. In other words, Dang Thuy Tram seemed to have suffered from unrequited love. Her boyfriend was represented by the earth element. The fire element was needed to produce earth. But fire was weak in winter due to the strong water. The weak fire cannot produce earth. Her boyfriend would probably be a weaker character than her.There was some earth in her未Goat day of birth. This pillar represented the husband star. If she had survived the war, it was possible that she might have had a somewhat happy marriage. However, without knowing her hour of birth, it would be impossible to deduce within any reasonable degree of accuracy.